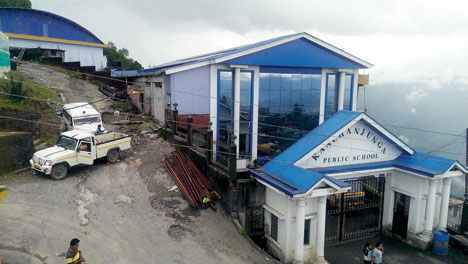 Darjeeling: Efforts to regularise Kanchanjunga Public School, a pet project of Bimal Gurung that was set by allegedly encroaching on tea garden land after fraudulently obtaining land documents, seems to have hit legal hurdles. The CBSE-affiliated school used to be run by Kanchanjuga Trust, which had Gurung's son, Avinash and daughter Nanda as members. Even though Bimal was not a member of the trust, it is largely believed that he is behind the project. However, after police received complaints, cases were registered against Avinash and Nanda for fraudulently obtaining land documents and setting up the school encroaching on land leased out by the government to a tea garden. Even though cases were registered, the school was allowed to function, keeping in mind the interest of students. The school runs classes from nursery to 10. Sources said the GTA wanted to regularise the school in the larger interest of the community. "A delegation of school teachers has been sent to Calcutta to explore all possibilities," said Binay Tamang, chairman, board of administrators, GTA. A source said that the delegation met school education minister, Partha Chatterjee in Calcutta, on Tuesday. "The minister said that it would be difficult for the state government to take over a private school. Adjusting that teachers in other schools also seems to be a problem as they are teachers of a CBSE-affiliated school," said a source. There are 25 teachers in the school who have gone without salary for the past six months. Nevertheless, the state government is trying to explore all measures. "The delegation was told by the minister to wait for a fortnight so that the government could revert with some solution. The minister said one probable solution might be to relocate the entire school somewhere so that the problem is solved forever," said a source. "The minister, however, assured that the students could be adjusted in other schools." It is learnt that Chatterjee is of the opinion that the GTA should not run a private institution. Efforts to regularise Kanchanjunga Public School, a pet project of Bimal Gurung that was set by allegedly encroaching on tea garden land after fraudulently obtaining land documents, seems to have hit legal hurdles.